I have been involved with Kensington Stables in the past. 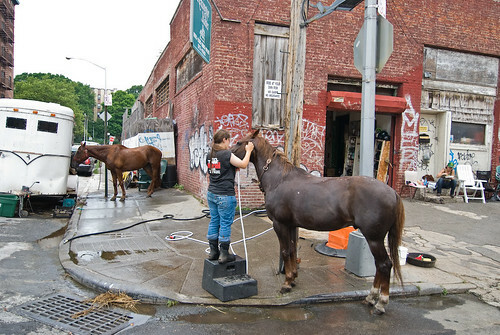 Kensington, Brooklyn, isn't an ideal environment for horses, though anyone who thinks that life turned out in a pasture is idyllic is kidding themselves. Just because a horse is in a field with plants, doesn't mean that they are receiving basic care. [In response to the article], Dr. Hynes addresses the issue of stall sizes, pointing to the even more stringent NY State regulations; however, it would be more informative if he could cite study data to explain how proposed stall sizes were determined. To require a 12'x12' stall for a Shetland Pony surely isn't what regulators had in mind. The new regulation requiring that horses are shipped off for five week furloughs is absurd and would compound the stress in these horses' lives. Every horse person knows about the risk of colic when transporting horses and introducing them to a new environment. I assume that is why Dr. Hynes didn't even address this issue. I can assure everyone who is taking personal shots at owner Walker Blankenship that he may be inbetween a rock and a hard place right now, but he's far from a horse abuser who's only in it for the money. Walker has taken in many horses that other people have abandoned, abused physically and psychologically, or are no longer suited for work in their previous jobs. Some of these horses earn the barn $0, but unlike most "operators," he continues to care for them. It's worth mentioning that horses at Kensington used to get some modified turnout, but that space was turned into the hulking stalled high-rise construction site across the street. Kensington Stables isn't a fancy show barn any more than it is a horse sanctuary. However, the horses get basic maintenance care (vaccinations, de-worming, regular shoeing, teeth floating, feed and anti-inflammatory medication). This isn't always the case, even at reputable show barns. I'll grant that the chestnut in the photo ("Spin Doctor"?) appears to be underweight, though that doesn't necessarily preclude him from modified work to maintain his condition. In the past two years, I have personally witnessed a case of a reputable trainer who neglected and starved clients' horses and been involved with more than one case of horses abandoned and neglected by their owners. If animal-rights activists are looking for a front-line target to improve the lives of our animal companions, they need to start with these hard cases and leave convenient targets like Walker alone. Maybe Walker will be able to keep Kensington Stables open, maybe not, but the uninformative or ignorant commentary and personal attacks published above won't improve the lives of any of his horses. If Walker is forced to close the barn, what does everyone think is going to happen? His choices will be to turn them out in a field somewhere, where he can no longer afford their care, or sell them. I guarantee you that most of the cases that he personally rescued won't make it past the slaughter-house truck. So, unless every Kenstington Stables basher steps up to adopt one or two of the Kensington horses and give him or her a home for life, then we should seek a more practical solution.